Greetings to Alumni of the Chemistry Department. You may notice a new face on this newsletter. 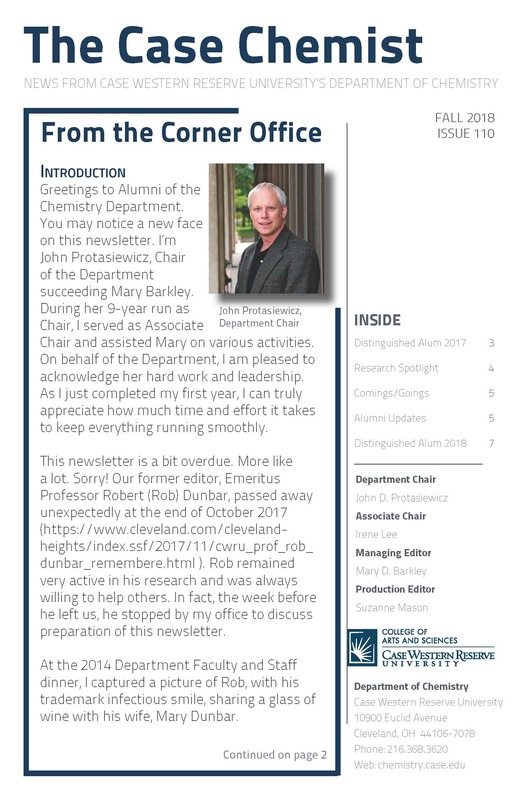 I’m John Protasiewicz, Chair of the Department succeeding Mary Barkley. During her 9-year run as Chair, I served as Associate Chair and assisted Mary on various activities. On behalf of the Department, I am pleased to acknowledge her hard work and leadership. As I just completed my first year, I can truly appreciate how much time and effort it takes to keep everything running smoothly. This newsletter is a bit overdue. More like a lot. Sorry! Our former editor, Emeritus Professor Robert (Rob) Dunbar, passed away unexpectedly at the end of October 2017. Rob remained very active in his research and was always willing to help others. In fact, the week before he left us, he stopped by my office to discuss preparation of this newsletter. 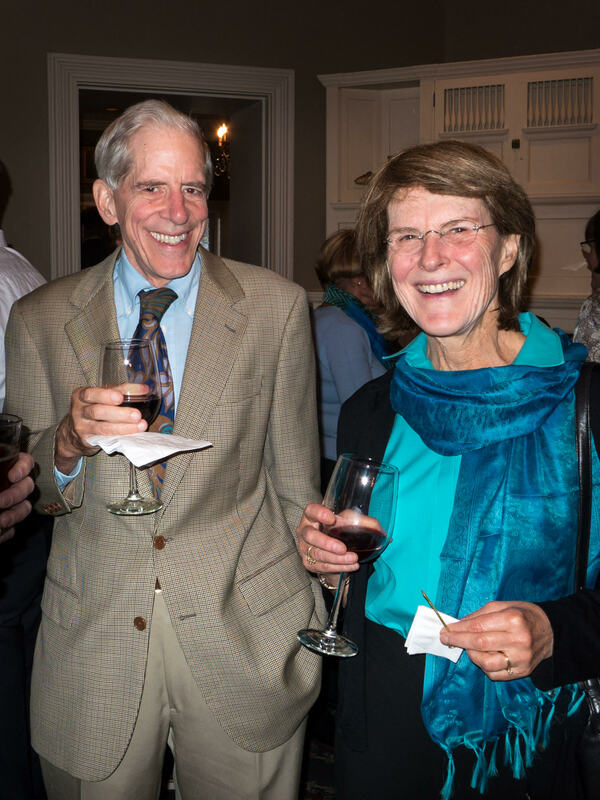 At the 2014 Department Faculty and Staff dinner, I captured a picture of Rob, with his trademark infectious smile, sharing a glass of wine with his wife, Mary Dunbar. Mary Barkley has taken over as editor of The Case Chemist. I must also acknowledge Suzi Mason for her outstanding work in producing a polished newsletter. The campus continues to evolve and transform in amazing ways. The Nord Family Greenway that stretches across Tinkham Veale Student Center, past the Cleveland Museum of Art, and up to the Milton and Tamar Maltz Performing Arts Center was dedicated on June 1, 2018. Our department has been actively revising its strategic hiring plan and is gearing up for hiring 1-2 faculty per year for the next few years. These searches will take much effort on our part to find the best people to complement our current research strengths while moving us into new and exciting research areas. Recruiting new faculty requires financial support as well. If you wish to help out with support for funds to establish new labs (startup or shared instrumentation funds) please let us know. Our faculty not only do great research, but they also innovate in the classroom. Mike Zagorski decided to think outside the bottle and offer an early summer course “Chemistry of Fermentation and Brewing.” Home brewing has long been a passion for him, and for this new course, he engaged speakers from local micro-breweries and took his class on “field trips” to brewing facilities in the Cleveland area. The Department ramped up its presence on social media. Our new Facebook page, and Twitter, @cwruchemistry, allow you to learn of new developments in the Department as they happen. In particular, Twitter can alert you to each week’s seminars and other ongoing events. This past year, we lost one of our most distinguished former faculty members, George Olah, winner of the 1994 Nobel Prize for Chemistry. As I write my first contribution to our long running newsletter, it is interesting to note that Professor Olah was the very first Chair of Chemistry for the combined Chemistry departments of Western Reserve University and Case Institute of Technology. 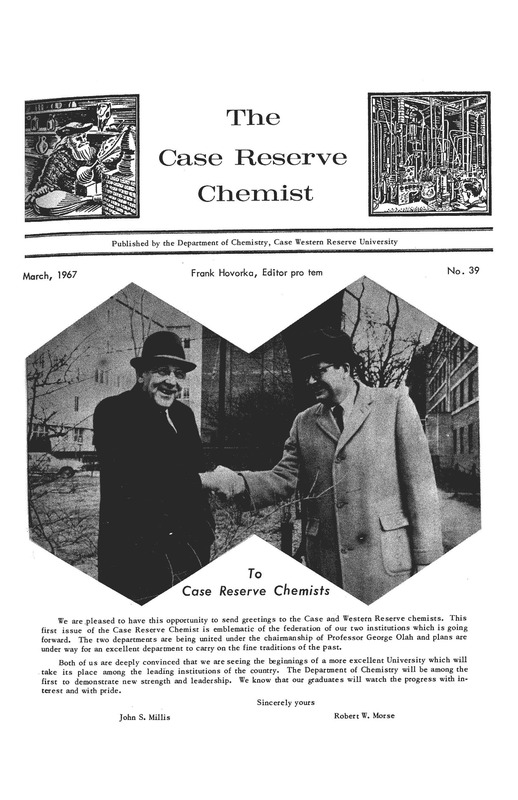 The page linked here features the first two pages of the March 1967 edition of the very first “Case Reserve Chemist.” Our message remains similar to George’s message 60 years ago – we hope you will stay in contact with us! Many of you have supported the department through generous gifts, and we thank you very much for these contributions towards our educational and research efforts. If any of you wish to speak or write to me about how you can help the department, please do not hesitate to reach out to me (protasiewicz@case.edu). If you happen to live near upcoming sites for the National ACS meetings (Spring 2019 in Orlando, for example), we might even be able to arrange a meeting. Carlos Crespo continued to receive American Chemical Society Project SEED grants to support summer research internships of economically disadvantaged high school students. Eleven high school students from the Cleveland area spent eight weeks in faculty labs in Summer 2017, eight of whom had returned for a second summer; there are three returnees and five new students in Summer 2018. 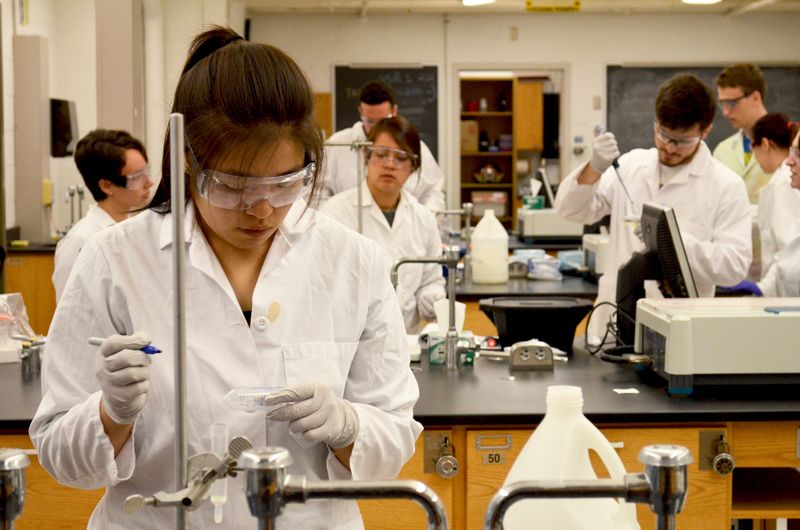 About 85% of the SEED students have gone on to college in STEM fields, including four students at CWRU. Thomas Gray was promoted to Professor. Mary Barkley was awarded a Distinguished University Professorship. Emily Pentzer was appointed to the Frank Hovorka Assistant Professorship in Chemistry. Rekha Srinivasan was appointed to the James Stephen Swinehart, PhD, Professorial Teaching Fellowship in Chemistry. 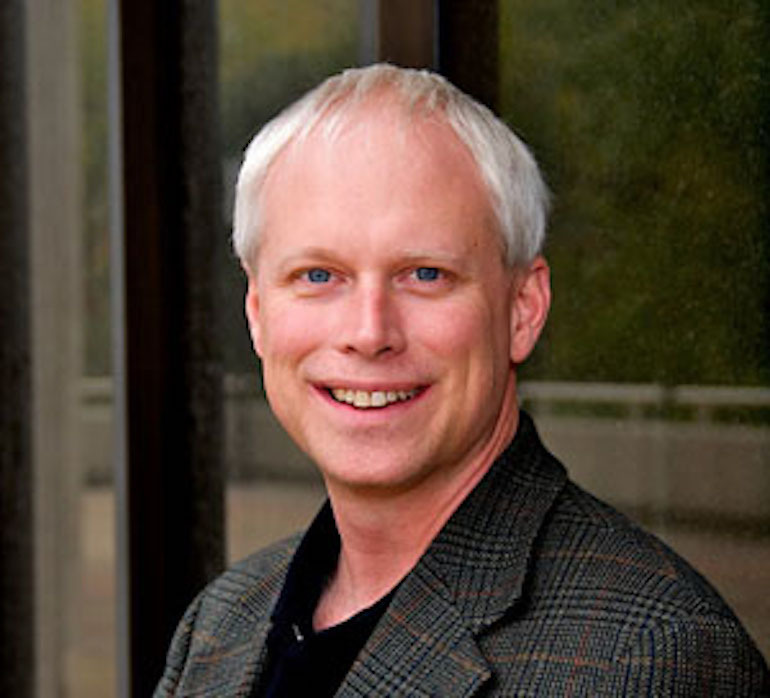 John Protasiewicz was appointed to the Hurlburt Professorship in Chemistry. He received the 2016 Morton L. Mandel Award for excellence in mentoring and research. Carlos Crespo received the 2017 Morton L. Mandel Award for excellence in mentoring and research. 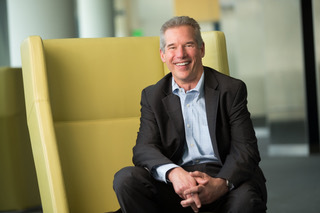 Michael O’Brien is the head of the Pharmaceutical Sciences Small Molecule Technology & Innovation (T&I) Group. He earned his BS degree from Ohio Wesleyan University, and in 1989 received is Ph.D. in Organic Chemistry from Case Western Reserve University under the guidance of Prof. Anthony J. Pearson. He joined Hercules Inc. in 1989, where he investigated the use of organic materials for unique optical applications. In 1992 he joined Rhone-Poulenc Rorer / Aventis Pharma as a Research Scientist. In 2001 Michael joined Wyeth Research Chemical Development as the Assistant Vice President of the Synthesis Research & Development group. Michael joined Pfizer in 2010 following the Wyeth acquisition. The latest addition to our faculty is Fu-Sen Liang, an Assistant Professor with research interests in chemical biology of RNA. Rajesh Viswanathan left CWRU to join the Indian Institute of Science, Education, and Research in Tirupati, Andra Pradesh, India as Associate Professor of Chemistry. Alfred Anderson and Mary Barkley retired as Professors Emeriti. Krista Cunningham replaced Ken Adair as full-time lecturer in Fall 2017. Krista was previously a lecturer at Ursuline College and Ohio State University. She received her PhD from Ohio State and BS from Youngstown State. Ken Adair moved to the University of Mount Union as Visiting Assistant Professor of Chemistry and Biochemistry. The department welcomes new staff to the main office. Yasmin Ruiz-Patterson has joined us to assist with graduate affairs and recruiting efforts. She is replacing Kelsey Forester, who has moved on to become Science Research and Instruction Librarian at the University of Georgia. Research in Fu-Sen Liang’s group integrates synthetic chemistry with tools and concepts from other disciplines to create unique strategies and methods to research microRNAs (miRNAs), epigenetics and cell engineering. The long-term goal is to develop novel anti-cancer therapeutic agents from these studies. In one project, they devised a bi-functional approach to regulate the biogenesis of miRNAs. Mature miRNAs are produced in cells via a series of enzymatic steps including the Dicer-mediated pre-miRNA processing. Instead of pan-cellular disruption of Dicer activity, with loss of the majority of mature miRNAs, the maturation of a single target miRNA is blocked using a bi-functional molecule. Alan M. Allgeier [BS ‘92]. PhD ‘97 Northwestern in chemistry. After 20 years in industry, he joined the faculty in Chemical & Petroleum Engineering at U Kansas in 2017. Tenured Associate Professor, really excited to be back in academia, building a research group around Sustainable Manufacturing, Catalysis, and Porous Materials. James W. Altschuld [BS ‘61]. MS ‘65 Ohio State in chemistry. Very productive career in education after PhD in educational research and development at OSU. Retired from OSU in 2004, still active in research and publishing as Professor Emeritus. Martin Arrick [BA ‘75]. Managing director, S&P Global, nonprofit healthcare team 1990–present. Recently moved to San Francisco Bay area after spending 40 years in greater New York City. Alfred (Kipp) Barksdale [PhD ‘70]. Enjoying retirement in Minneapolis, MN with occasional interruptions from consulting projects and writing MSDSs. Nathan Beals [BA ‘12]. PhD ‘18 Kent State in medicinal and pharmaceutical chemistry. Alex Belianinov [BS ‘07]. PhD ‘12 Iowa State in analytical chemistry. R&D Staff Scientist at Oak Ridge National Laboratory and faculty member at U Tennessee Bresden Center. William von Benken [MS ‘69]. Retired and living in Willoughby, OH. Adriel Betttelheim [BA ‘84]. Health care editor at Politico, a national news organization in the DC area. Michael Bokoch [BS/BA ‘03]. Assistant Clinical Professor, UC San Francisco. Happy to announce the birth of their first son in August 2017. John Bradshaw [BS ‘90]. R&D Chemist at Valtris Specialty Chemicals in Independence, OH. Andrew Brem [BA ‘70]. MD ‘74 Tufts. Retired in 2009 as Professor Emeritus of Pediatrics, after 30 years on the faculty of Brown U Medical School and medical staff of Rhode Island Hospital. Taught students, residents, and fellows, had a clinical practice, and did bench research in renal physiology and steroid biochemistry. Donald S. Burke [BA ‘67]. MD ’71 Harvard. Currently, Dean of the School of Public Health at Pittsburgh, has received John Snow Award from the American Public Health Association. Li Che [BA ‘12]. MD ‘17 U Miami. Anesthesiology resident at Albert Einstein School of Medicine. Andrew Chomas [BS ‘12]. PhD ‘18 U Colorado in physical chemistry. Allan David [BS ‘83; MS ‘85]. Living in Midland, MI. Richard Davis [BS ‘67]. Retired from Dupont as Sr. Research Associate, Crop Protection Products. Nihal Deligonul [PhD ‘13]. Associate professor at Gaziosmanpasa U in Tokat, Turkey. Madonna DiBella [BA ‘16]. 3rd year medical student at SUNY Downstate College of Medicine. Riki Drout [BS ‘16]. PhD candidate in chemistry at Northwestern. Won the L. Carroll King Award for Excellence in 100-level Teaching and the 2018 Innovations in Nuclear Technology R&D Award. Stacy Feldman [BA ‘72]. CEO of The Do It Now Foundation in Philadelphia, PA.
Paul C. Filon [BA ‘93]. JD ‘09 U Akron. Intellectual property attorney at Buckingham, Doolittle & Burroughs in Akron, OH. Emily (Birkel) Forrest [BA ‘09]. MS ‘11 Ohio State in food science and technology. Knowledge base manager at Givaudan Flavors in Newport, KY.
Paul J. Gallo [BS ‘66; DDS ‘68]. Chief Oral Surgeon at Beach Army Hospital in Ft. Wolters, TX during Vietnam War. Retired from dental practice of 41 years and living in Darien, CT.
David W. Goetz [BS ‘68]. PhD ‘72 Princeton; MD ‘81. Uniformed Services U of Health Sciences. Retired and living in Suffolk, VA.
Seth Goldberg [BS ‘17]. Graduate student in chemistry at Carnegie Mellon. Gary Hahn [BS ‘73]. Founded an environmental consulting firm in 1987 that investigates and remediates contaminant hydrogeology. President, Hahnand Associates. Howard Harris [BA ‘61]. PhD. Professor Emeritus, U New Haven. David Hildebrandt [BS ‘13]. MS ‘15 U Minnesota in inorganic chemistry. Lab research chemist at Volt in Minneapolis, MN. Chuck Hoffheiser [BS ‘74]. MBA ‘90 U Tulsa. 17 years in marketing, product management, business strategy in the specialty chemicals industry followed by 25 years in senior positions in corporate planning and economics in the oil refining and marketingindustry. Retired from CITGO Petroleum Corp. in 2016 and living in The Woodlands, TX. Ao Jingning [BS ‘13]. Statistician, IHRC Inc./Centers for Disease Control and Prevention. Junhwan Kim [PhD ‘06]. Assistant Professor, Feinstein Institute for Medical Research, Northwell Health in Manhasset, NY. William Lang [BA ‘13]. MD ‘18 New York Medical College. Resident physician at the Warren Alpert Medical School of Brown U.
Richard Lewis [BS ‘64]. Retired and living at Leisure World in Mesa, AZ. Mark Lipke [BS ‘08]. PhD ‘13 UC Berkeley. Postdoc with Sir Fraser Stoddart at Northwestern. Assistant Professor of Chemistry & Chemical Biology at Rutgers, The State University of New Jersey. Arnold Lipson [MS ‘64]. Retired and living in Cuenca, Ecuador. Shu (Situ) Lowenstein [PhD ‘16]. Advanced Scientist at Owens Corning in Indianapolis, IN. Filed applications for patent and trade secret in the past year. Welcomed first child in March 2018. Paul Malchesky [MS ‘71]. MS ‘77, PhD ‘83 Cleveland State in chemical engineering. Chief Science Officer at Timilon Technology Acquisitions in Painesville, OH. Cleveland State Distinguished Alumni Award and Outstanding Engineering Alumnus Award in 1990. 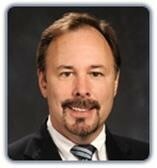 Elected Fellow, American Institute for Medical and Biological Engineering in 1997 and Ohio Academy of Science in 2006. Martin Minter [BS ‘73; MBA ‘77]. Retired and living in Painesville, OH. Anne Murphy [BA ‘11]. Pediatric resident at Inova Children’s Hospital in Falls Church, VA. Captain US Air Force. Syed Saad Mahmood [BA ‘04]. Cardiology Fellow at New York Presbyterian Hospital/Weill Cornell Medical Center. Emily (Bloomfield) Ortega [BS ‘00]. She and her husband own and run Ortega National Parks, a business that operates hotels, restaurants, and gift shops in National Parks and Monuments. Rebecca Zaniewski Page [PhD ‘95]. Professor of Chemistry at Florida Southwestern State College–Charlotte in Punta Gorda, FL. Chelsea Peck [BA/BS ‘12]. MBA ‘18 Carnegie Mellon Tepper School of Business. Commercial Manager, Arconic in Savannah, GA.
Xinzhan Peng [PhD ‘01]. Sr. Staff Scientist at Thermo Fisher Scientific in San Diego, CA. William Pletcher [BS ‘70]. Retired and living in Sacramento, CA. Boguslaw Pozniak [PhD ‘95]. Assistant Professor at Institute of Heavy Organic Synthesis (ICSO) Blachownia and living in Wroclaw, Poland. Robert Purtell [BS ‘73]. Materials scientist at Silfex in Eaton, OH. Member of team receiving corporate environmental award: Minimizing Chemical Consumption for Semiconductor Wet Water Cleaning. Michelle Rasmussen [PhD ‘12]. Assistant Professor of Chemistry, Lebanon Valley College in Annville, PA.
Allan Reed [MS ‘64; PhD ‘68]. Research chemist for the last 27 years at Technic, Inc., a supplier of precious metal electroplating solutions, Enjoying some traveling, including a Rhine River cruise in 2017. David Rothfeld [BS/MS ‘80]. Retired and living in Bethesda, Maryland. Jared Sampson [BA ‘03]. MA ‘17 Columbia in structural biology & computational chemisty. PhD candidate in computational chemistry and molecular biophysics at Columbia. John Scarry [BS ‘69; PhD ‘84 in anthropology]. Term Associate Professor, U North Carolina. Kelly Smith [BS ‘90]. Research analyst in Institutional Research, Adjunct Instructor of Chemistry at Central Piedmont Community College in Matthews, NC. Stuart Smith [BS ‘62]. Retired from Dupont, Operations Manager–Laboratory and living in Leland, NC. Christine Tam [BA ‘94]. MD ‘99 Ohio State. Dermatologist in Strongsville, OH. Ashkay Tambe [BS ‘12]. PhD ‘18 UC Berkeley in cell/cellular and molecular biology. Scientist at Spotlight Therapeutics in Hayward, CA. David Tolentino [BA ‘97]. DO ‘02 Ohio U Heritage College of Osteopathic Medicine. Associate Dean for Clinical Affairs at Campbell School of Osteopathic Medicine in Lillington, NC. President of North Carolina Osteopathic Medical Association in 2018–19. Ulman Tzipor [BS ‘94]. PhD ‘03 Stanford in physical chemistry. Sydney Vereb [BA/BS ‘16]. Lab technician at STERIS in Mentor, OH. Donald Weiss [BS ‘54]. Retired physician living in Bonita Springs, FL. Jianye Zhang [PhD ‘11]. Research Associate, CWRU. Jolla, CA and has had leadership roles at Abbott Laboratories and Eli Lilly. Michael holds a Ph.D. in Chemistry from Case Western Reserve University and completed his postdoctoral study at Harvard University. We are proud of the accomplishments of our faculty, students and alumni. Let us know about job changes, awards, honors and life events. Please email your news and contact information updates to chem-updates@case.edu. Alternatively, you may mail your updates on a letter or postcard. We ask that you please include your name, current date, your CWRU degree(s) and year(s) (e.g. BS ’78), address (city, state), employer, position or title, as well as the news about your career, honors, or major life events.